Amid the ongoing political uproar over Donald Trump’s undisclosed tax records, the New York Times dropped a bombshell late Saturday when it reported that, due to a staggering loss of $916 million in 1995, it is possible that the Republican presidential nominee has not payed taxes in nearly two decades. 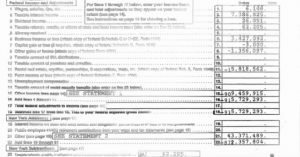 Times reporter Susanne Craig obtained three pages from Trump’s 1995 tax returns—one page of a New Jersey nonresident return, one page of a Connecticut nonresident return, and a New York State resident income tax return—by way of an anonymous mailing, with a return address listed as Trump Tower. 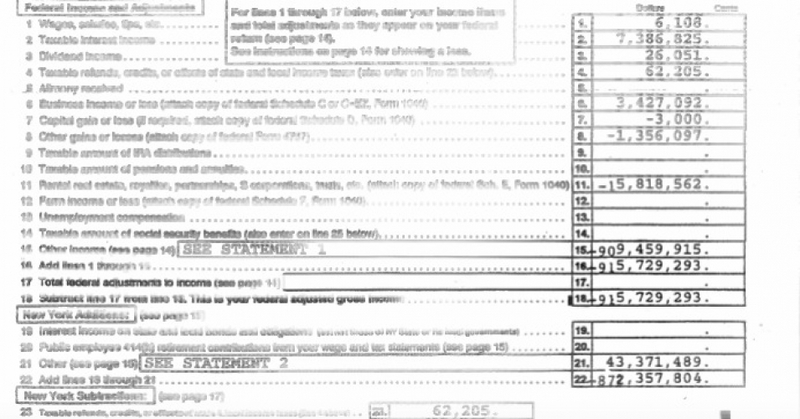 The provision, known as “net operating loss,” or “N.O.L.,” allows a dizzying array of deductions, business expenses, real estate depreciation, losses from the sale of business assets and even operating losses to flow from the balance sheets of those partnerships, limited liability companies and S corporations onto the personal tax returns of men like Mr. Trump. In turn, those losses can then be used to cancel out an equivalent amount of taxable income from, say, book royalties or branding deals. Better still, if the losses are big enough, they can cancel out taxable income earned in other years. Under I.R.S. rules in 1995, net operating losses could be used to wipe out taxable income earned in the three years before and the 15 years after the loss. And while the real estate mogul’s income in subsequent years remains unknown, such a loss in 1995 “would have been large enough to wipe out more than $50 million a year in taxable income over 18 years,” the Times reported. Middle class families pay their taxes. But billionaires like Mr. Trump don’t have to thanks to their friends in Congress. Indeed, Trump’s refusal to release his tax records has become a major flash point in an increasingly tense presidential contest. Claiming that he cannot release the documents because he is currently being audited, the Republican nominee has broken decades of precedent, beginning with President Ronald Reagan in 1980. Mr. Trump is a highly-skilled businessman who has a fiduciary responsibility to his business, his family and his employees to pay no more tax than legally required…That being said, Mr. Trump has paid hundreds of millions of dollars in property taxes, sales and excise taxes, real estate taxes, city taxes, state taxes, employee taxes, and federal taxes. ← Who Owns Your Tattoo? Maybe Not You.